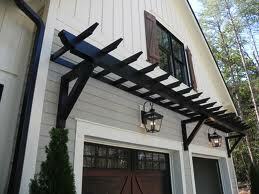 Let's start small with an over the garage door trellis. Disclaimer; please make sure you are sober before handling any power tools! This type of trellis is an easy weekend project and as mentioned above will add a luxurious element to your exterior facade. 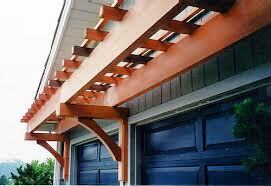 Start with the brackets on either side of the garage. 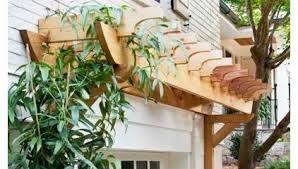 The garage in the picture above is fitted for two cars but you can build your trellis for any size garage. The longer the width, the more reinforcement you will need. In the above image it was necessary to insert a bracket between the two doors. 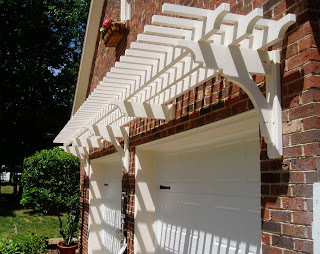 If you do not have this option (i.e., if you have a two car garage and no space in between) you may have to fix a small reinforcement piece in the center of the trellis. 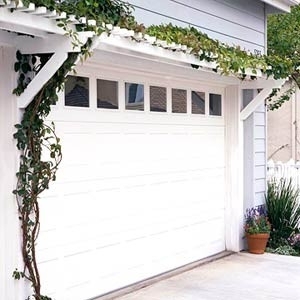 However, a standard two car garage door should sustain a trellis with only two brackets on either side. Use 2x4s for your bracket backings and cut them approximately 25" long. I suggest using pressure treated wood. Secure these bracket pieces to your home's exterior with the proper hardware (i.e., if you are screwing into concrete you will need a Tapcon). Your local hardware store will be able to help you find the proper fastener. Next come the decorative pieces you add to the bracket that is fixed to the garage or exterior surface (technically still part of your bracket). These pieces hold up your joists (the beams that run along the width). The above picture uses a 2x8 for the top piece and a 2x6 for the lower curved piece. These curves and notches are achieved through the use of finish carpentry equipment (most likely a router). If you do not have access to this type of equipment you can mark your wood and bring it to your local hardware store and they will cut it for you (some charge a minimal fee). You will screw these additional bracket pieces into the fixed bracket base with wood screws. There are really no exact measurements for the brackets so I would say this is where you need to get a little creative. The picture below shows another trellis option with less intricacies in the bracket design. Next you will cut and install the joists. These are the pieces that run parallel to each other across the span of your garage or exterior opening. Use 2x6x12s or which ever length you need for your respective space. The key here is using a 2x6 material. Finally you can use 2x2 pieces to finish the top running perpendicularly to the joists (you can find nice finished 2x2 pieces in the fencing section of your local hardware store). I would suggest setting them approximately 6"-12" apart depending on your preference and they should hang over your joist piece about 4". The very last step is to paint your trellis and then you are finished! This is a very easy project. If you organize your layout and sizes and know what you need you can simply go to the hardware store with your list and have all your material ready and cut before you leave! Below are some additional pictures of over the garage trellises. Enjoy the project and get creative. There is no need for an extremely detailed set of instructions. Every trellis is different and you should find a way to make it your own! So now you know how to build a trellis and more importantly you know how to pluralize the word! If you have any questions please feel free to comment below and stay tuned for more DIY projects in the series!